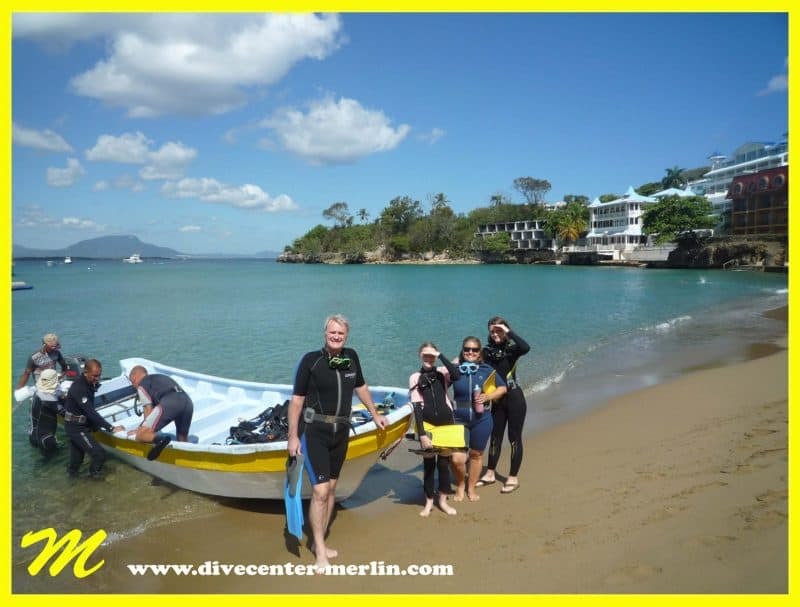 We drove to the nearby town of Sosua, which is where most of the diving takes place in this area. Not only is the bay a little calmer, but there are some great reefs there too. The diving shops are all in a row and you really can’t tell one from another, but we went with a recommendation from a friend and at Zoe’s request, we went with the dive shop that started us off in the pool. Those of you who have dived before will find this whole explanation boring familiar but for those of you entirely new to this process, like I was, I thought you’d be interested. We showed up at 9 a.m. with nothing more than our swimsuits and a towel. 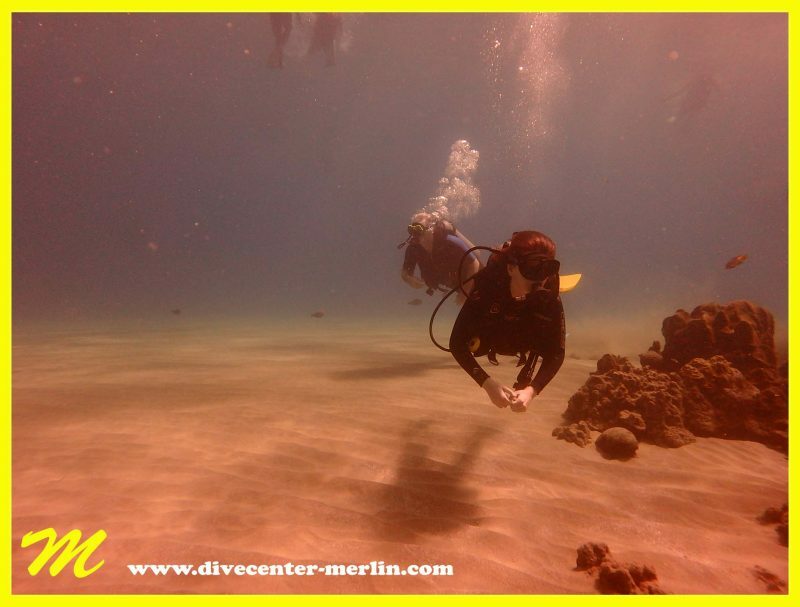 We did some paperwork and then began a 45-minute class on the basics of diving. 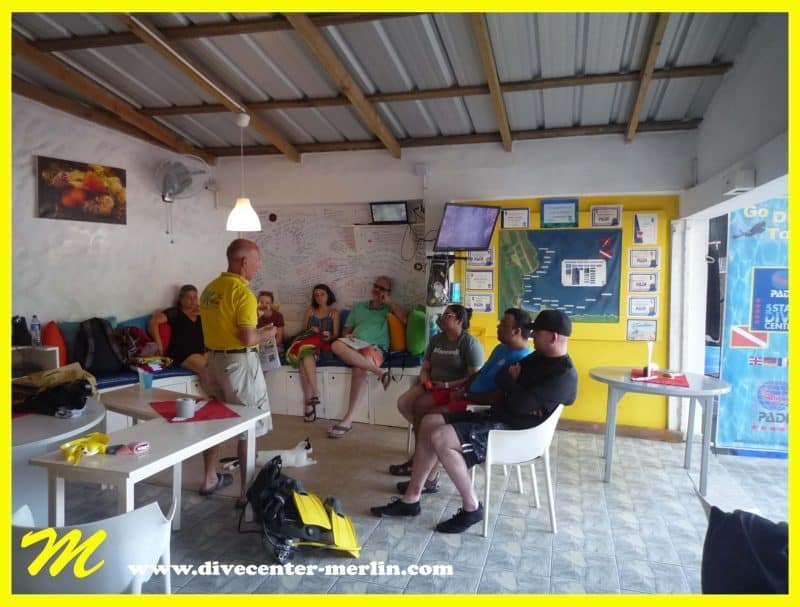 Our instructor went over some details like the equipment, equalizing your ears under water and how to communicate with each other under water. 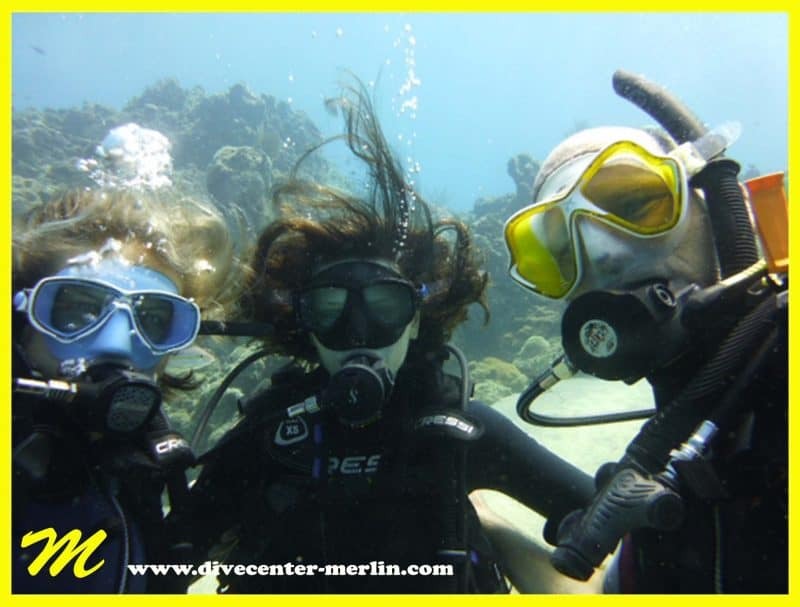 The girls say they are now fluent in English, Spanish and SCUBA. 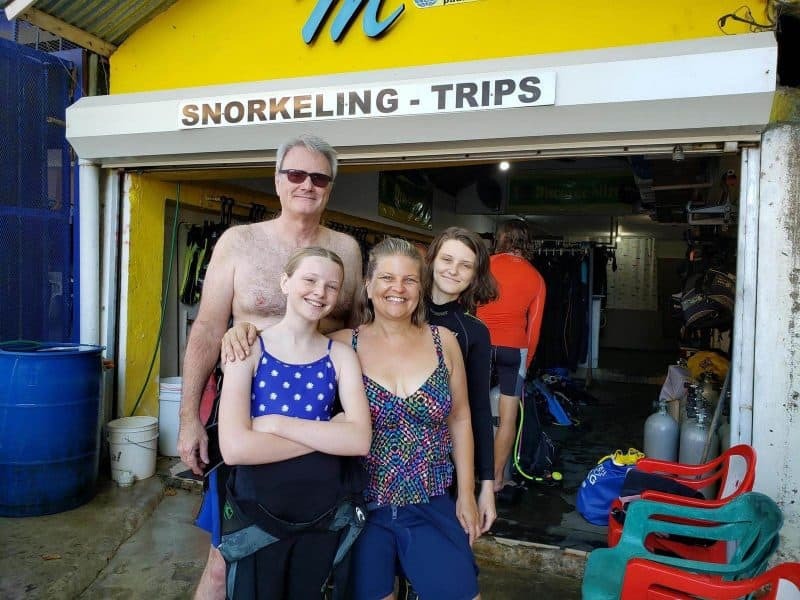 SCUBA class for the Shermanos! We were in a group of 7 people so the other 3 people went to the pool for their practice dive first while we got fitted for our equipment. It was quite the lengthy process to get all the equipment. 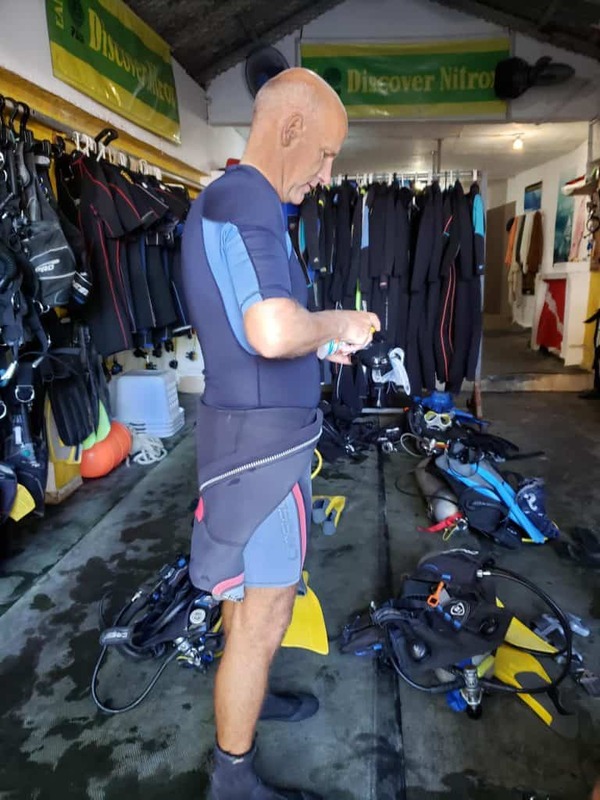 You had get sized for the right fins, wet suit, and mask and there was a lot of trial and error, especially for 4 people, 2 of whom are quite picky. #notme #notHaley Finally it was our turn in the pool. The process pool-side involved a lot of adjusting, buckling, and strap tightening and it went a little too fast for Zoe, so she opted to watch for awhile first. Dan, Haley and I did as we were instructed and fell head-first into the pool. It definitely takes awhile to get used to the breathing, and not sprinting to the surface for air. However, I found the pool floor to be quite interesting so I just allowed myself to wander while the instructor worked with Dan and Haley. I was surprised at how dirty the pool was and I vowed never to SCUBA dive in the pool at our apartment. What you don’t know won’t kill you. Although that’s probably not a good rule in SCUBA. Pool-side adjusting. Zoe had opted out at this point, you see the space she left between Dan and Haley. Once in the water, I had to tell myself: “you are breathing, just breathe, you have air” and eventually it became less panic-inducing. Haley and Dan got the hang of it right-quick and other than Dan’s endless mask-adjusting due to his mustache, they took to it like… well… fish to water. 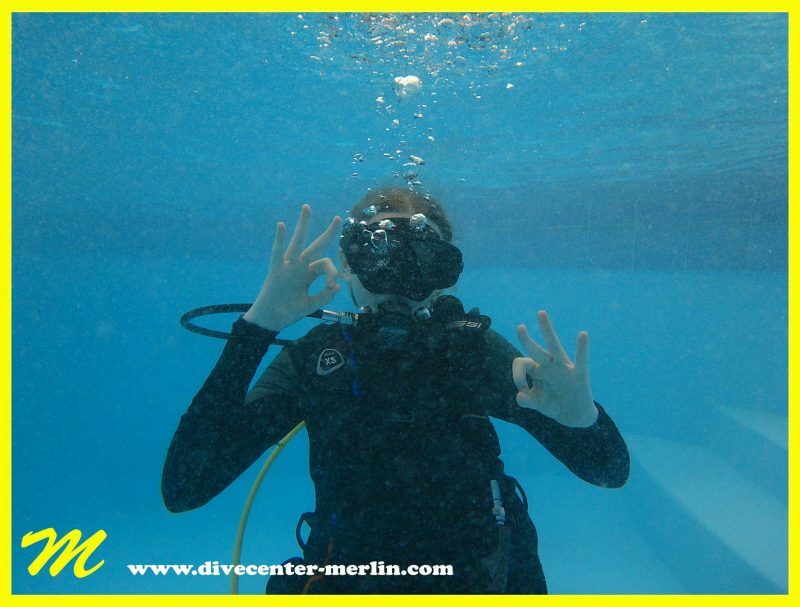 I had my mini underwater class with the instructor and figured things out pretty well too. By the time I was done, Zoe was ready to try it. 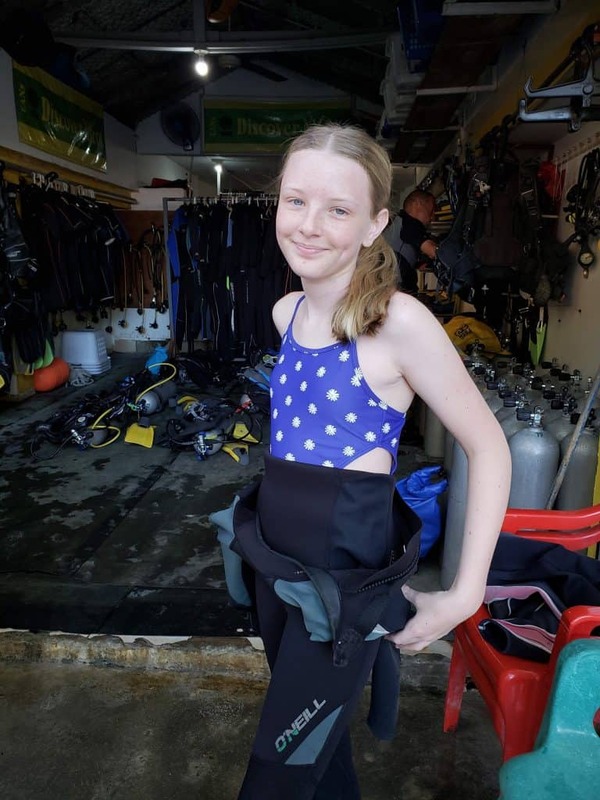 She definitely struggled a little more with all the equipment and the functionality of breathing underwater, but she did it and we were all proud of her. Zoe in the pool, giving the OK sign that she was doing well. Dan and I in the pool. Due to our extended time in the pool, it was now 2:30 in the afternoon. This is a long day! 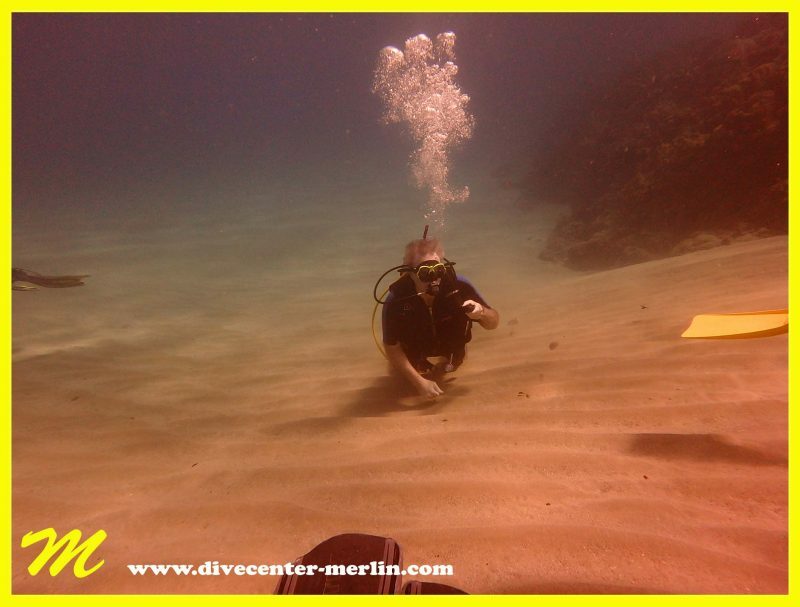 The normal trial day process includes heading out into the ocean for a practice dive in the afternoon. But due to Zoe’s reluctance, our hunger for lunch and some choppy water, we decided to come back another day for our practice ocean dive. 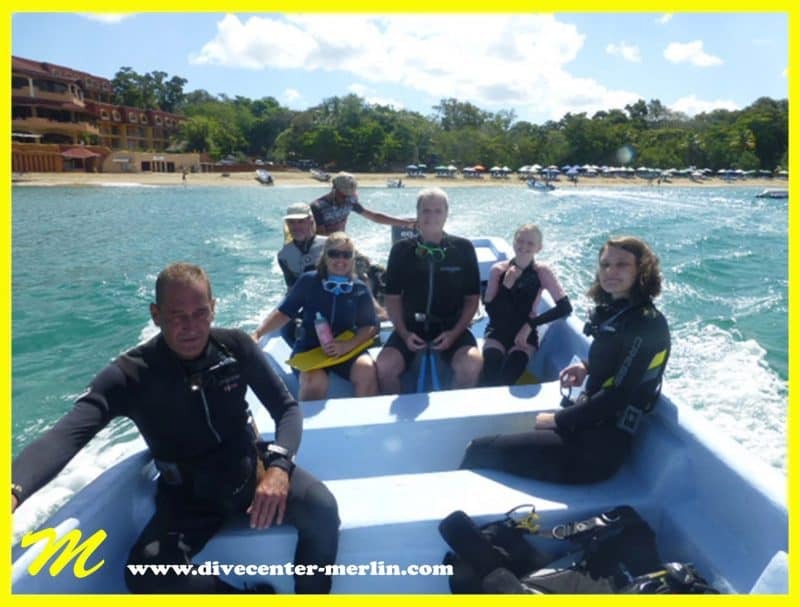 We really appreciated how Merlin Dive Center took the process very slowly for us and let us work at our own pace. A few days later we showed up again at 9 a.m. (we don’t like the “early” start times but we also don’t like the potential for rougher waters in the afternoon). This time we all knew our sizes of the equipment pretty well. 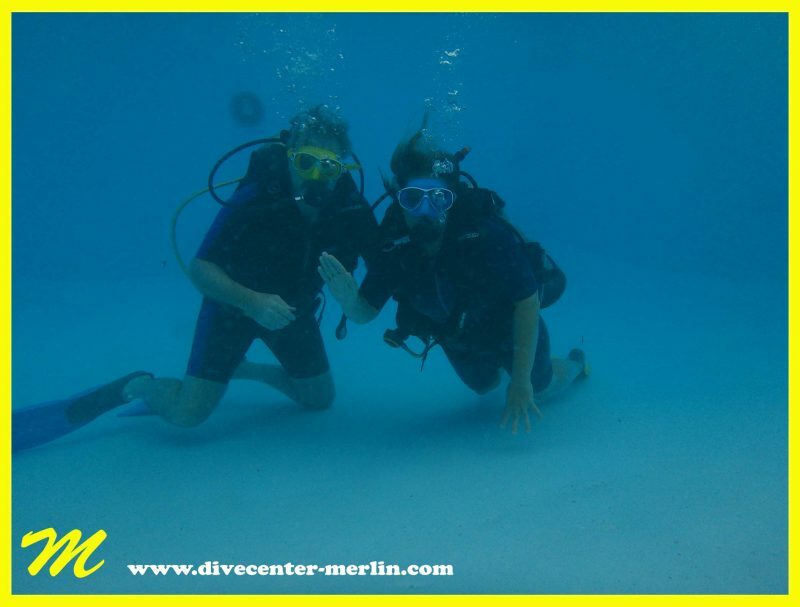 Dan and I are fine with wet suits that have short sleeves and short pants – we do not get cold in the water. But Zoe and Haley both needed long wet suits and Zoe even doubled up on her suit. 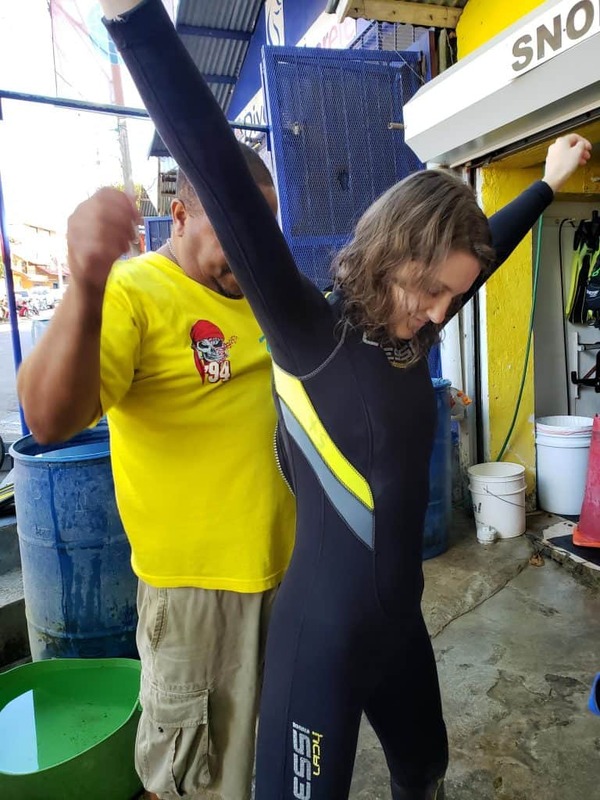 When you’re not in the water, the suit feels quite cumbersome but I was shocked at how light and unobtrusive everything felt once you get into the water. There’s a LOT of heavy equipment involved in this hobby. I definitely like having a dive shop who takes care of it for you. Haley needed a lot of help squeezing into her dive suit. And in the end they still said it was a little big on her. Helpful tip: when your suit is wet it’s easier to adjust. Zoe is getting her suit on with less help. She does not like to be manhandled. We got a briefing for how the day was going to work, including a reminder of our underwater communications. 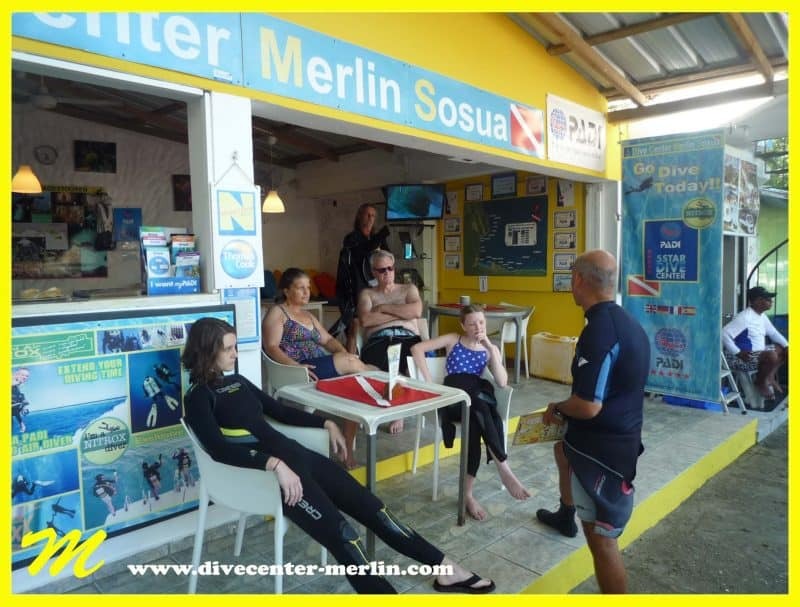 We had a private class with 3 diver instructors and the boat captain. Off we went! The day’s briefing. These guys were great at telling us exactly what to expect. I nicknamed Haley “Flat Stanley” when she had her suit on. Ready for diving! Dan is not naked, he’s just halfway suited. Long-time readers will notice Zoe’s recent growth spurt. A short boat ride later and we were there. They brought us very close to the beach so Zoe could get into the swing of things a bit more slowly and in shallow water. 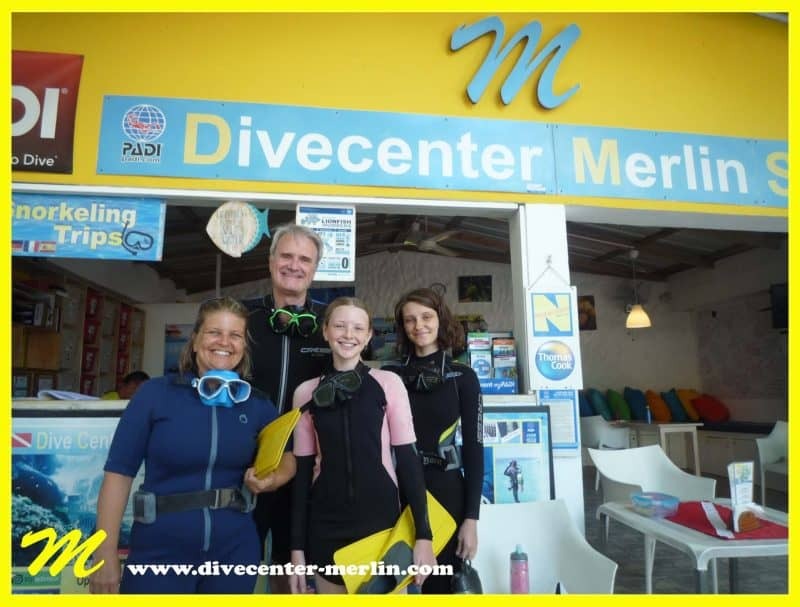 So Zoe and I jumped in and began working with the instructor. Another two divers went deeper and worked with Haley and Dan. Taking the boat directly from shore. Easy peasy. Very calm waters. On the boat. It felt like we had a lot of people helping us, and we appreciated it. I had no issues but Zoe struggled a lot with her mask. She managed to stay under water for awhile and resisted the urge to head up to the surface for air. The mask continued to frustrate her, however. After working at it for awhile she declared herself done and decided to wait in the boat while the rest of us completed our dive. 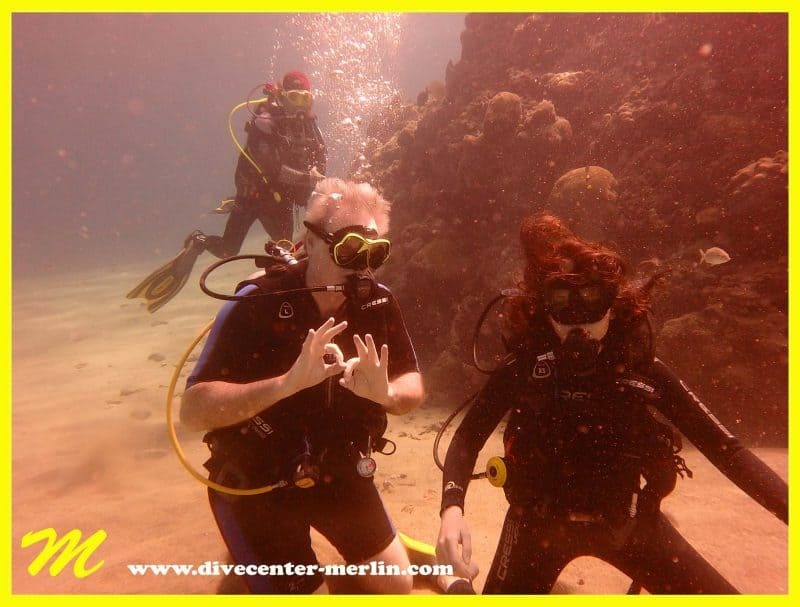 My instructor and I swam off to find Dan and Haley and we had an awesome time checking out the reef. Haley and Dan, checking out the reef. Their camera was messed up so it appears they are diving on Mars. But no, they are still on Earth. Haley and me and our instructor. He was very attentive. Note the actual colors around us. Not the red Mars colors. Me! (Allison) Having a great time! Back to Mars. Dan and Haley, doing well. Dan, checking out the bottom of not-Mars. After about an hour of diving we were getting pretty fatigued and our air tanks were starting to get low. We returned to the boat and returned back to the shore. We were all feeling a little queasy at that point, probably due to the oxygen and getting used to diving. It was an excellent day. We enjoyed it thoroughly. Zoe was glad to have sampled it but is not a big fan of the sport. We are really proud of her for how far she went in the process, because she was clearly outside her comfort zone. 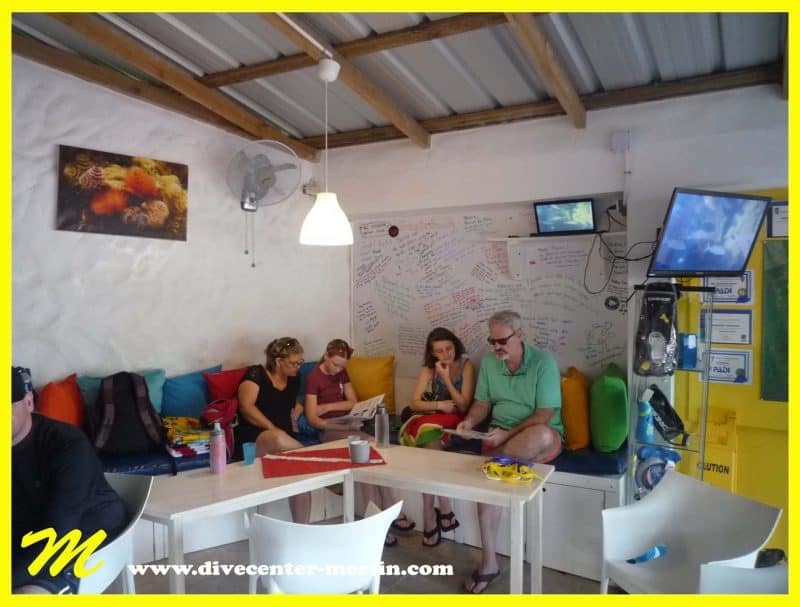 She and Dan have decided they don’t want to continue with the PADI certification, but Haley and I are making plans to do it. Zoe and I – the more extroverted members of the family – are usually partnered in activities so I will enjoy doing something with Haley this time. 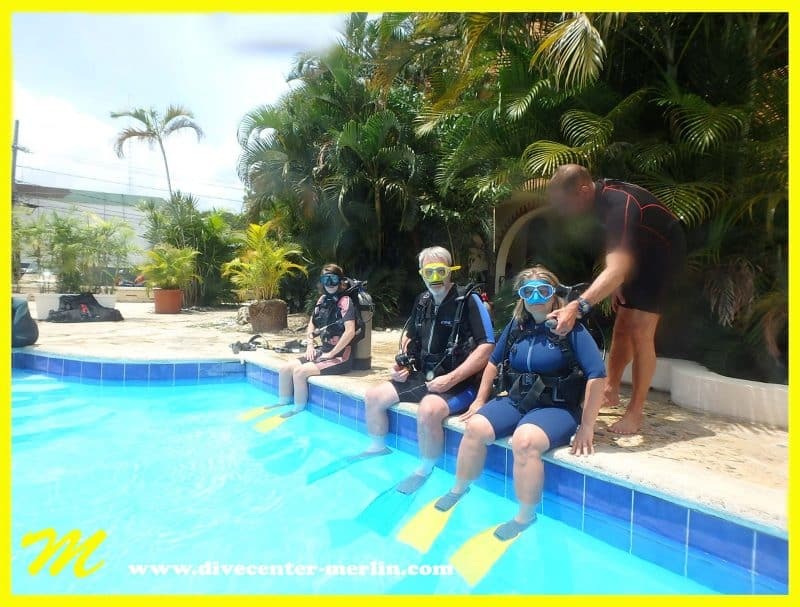 We’ll keep our loyal readers updated on the process of the PADI certification. 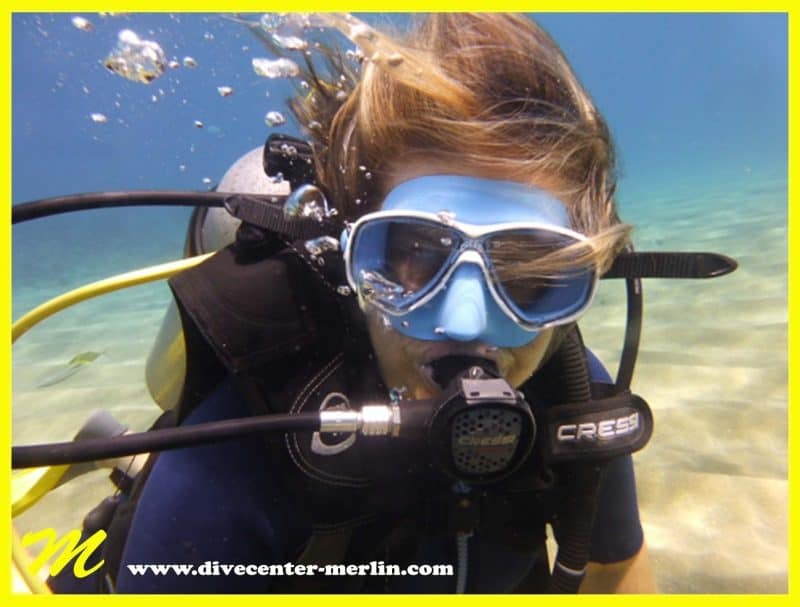 Haley was not allowed to have anything in her hands on her first dive, but as soon as she’s given permission to take down a camera, we’ll overwhelm you with pictures of sea creatures.